Our two styles of Battle Dress Mini-Breastplates also use genuine hairpipe, glass and solid metal beads strung on handcut deer hide lace. Both feature the Slide Bead Closure. Their design and smaller size (about 1' sq.) 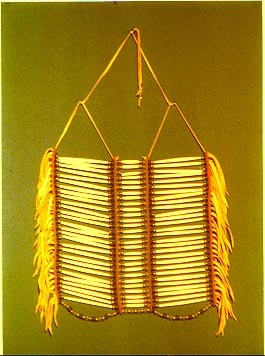 follows early styles of northern plains breastplates developed by the Lakota. Our Basic Breastplates have three sections of 17 lines of hairpipe. The two outer sections are 1 1/2" hairpipe and the center row is 1" hairpipe, as shown on the right. Our Shell Casing Breastplates have a center section which incorporates 2 symmetrical rows of 17 lines of shell casings. Both styles can include metal beads, glass beads or both in their design. The smaller size of our Mini-Breastplates make them ideal as gifts to young aspiring dancers! Or, if you're looking for quality decorative wall hangings, the Battle Dress Mini-Breastplate can meet your needs! With the Mini-Breastplate you can have your own Battle Dress Breastplate at a fraction of the cost of larger breastplates! *note -Since our hairpipe jewelry is strung on handcut deer hide laces, we only use the horn hairpipe (amber, black and red) in our Battle Dress.